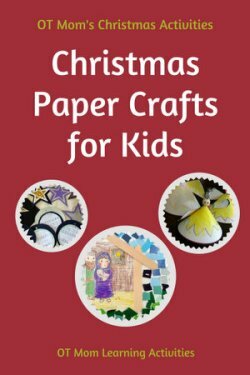 Christmas paper crafts for kids can give your child lots of practice with cutting, tearing, pasting and folding paper. 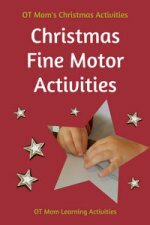 Great for working on fine motor, coordination and planning skills! Have your child tear or snip paper strips into small pieces and then use the pieces to collage the background of a regular coloring picture. In the image above, we printed a standard nativity scene picture at 80% of the size (use the preview function on your printer to see what it would look like). Then we built a stable outline with popsicle sticks and pasted our snipped paper all around the picture. Looks stunning! Why is this a good activity? tearing paper with the tripod fingers helps your child to isolate the use of the fingers that are needed for pencil control. Show your child how to position the thumbs together on the paper (as above) to make tearing easy. snipping paper can help a young child learn to master the art of opening and closing scissors. If your child struggles with this, try some of my scissor cutting tips and techniques. your child is using bilateral coordination when both hands are working together to tear or snip. Eye-hand coordination is used to paste the paper collage. Cut the paper strips ahead of time to make it easier for your child, or have an older sibling cut the strips. Make a cardboard template from a cereal carton or thick cardstock and have your child trace around it onto various papers. Wrapping paper and sheet music can make a pretty addition to regular colored cardstock. 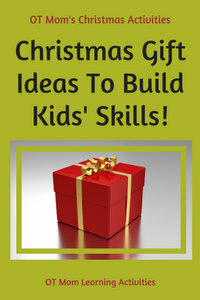 Layered decorations are perfect Christmas paper crafts for kids! We used different sizes of stars and circles to make these cute layered paper crafts. 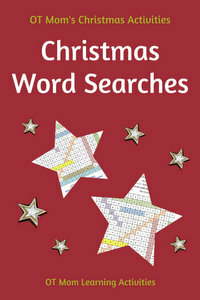 We pasted them onto Christmas cards and used them for gift tags and tree decorations. Tracing around a template or stencil requires your child to use both hands together in a coordinated way. One hand is doing most of the work, while the other is assisting. 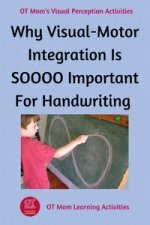 This is an important component of writing skills in the classroom. Tracing around a template requires your child's eyes to guide the hand in staying on the outline of the template. 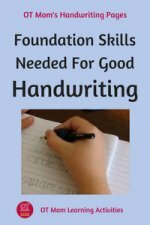 This is called visual-motor coordination, which is very important in handwriting. 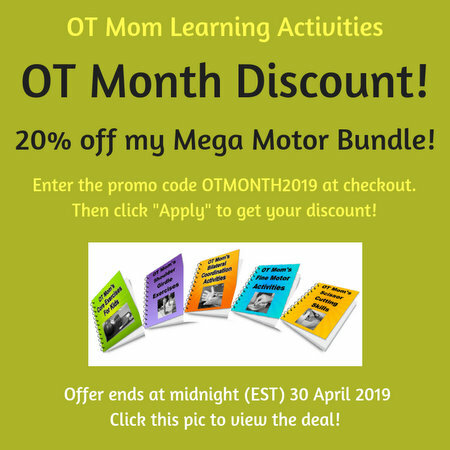 Getting all the way around the template will require your child to plan how to move the hands without bumping the template, and may also involve some crossing of the midline. If you like the idea, but your child struggles with the tracing aspect, print out this free star template onto regular colored cardstock and just have your child cut the shapes out. 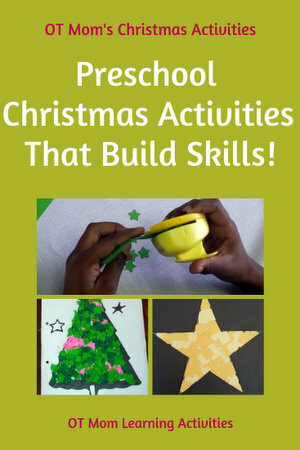 If the stars suggested above are too tricky for your child to cut out, try some of these simpler, scissor cutting Christmas paper crafts for kids! Straight lines are easiest for kids to start with, then they can progress to simple shapes like circles and triangles. Click on each image below to get instructions and free templates for each activity! Why is scissor cutting a good activity? Scissor cutting requires that both hands work together in a coordinated way to keep the scissors cutting on the line and around the corners. 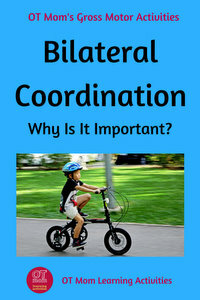 If your child struggles with this, read my page on bilateral coordination for some info and tips. 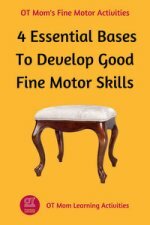 Your child will also be using some visual-motor coordination skills as the eyes guide the hands to stay on the lines. Use scissors that are the right size for your child's hands, and if your child is a leftie, the scissors should be special left-handed ones. Read more scissor cutting tips! 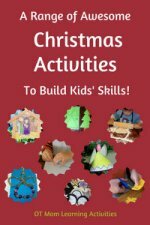 This awesome webpage about Kirigami for Kids has some lovely folding and cutting ideas that would make great Christmas paper crafts for kids. Why is Kirigami a good activity? Folding requires eye hand coordination, careful planning and following instructions. Children also need to use just the right amount of force to create folds and manipulate the paper without tearing. Gives additional scissor cutting practice with a lovely end product! Thanks for visiting! May your Christmas be blessed with much love and peace in your home! "Today in the town of David, a Savior has been born to you; He is Christ the Lord."